The availability of qualified software engineers has not kept pace with the demand from industry, so that systems are designed and built by people with insufficient educational background or experience. Software is abstract and invisible. Software has both static and dynamic properties. Software is intrinsically complex in terms of its organization. No universal measures of quality exist for assessing a software product. The manufacturing cycle for software products is not a significant element in software development, and it mainly involves the needs of distribution mechanisms. Software does not wear out. Software engineering practices are therefore largely concerned with managing relevant processes and with design activities. A high-quality faculty and staff is perhaps the single most critical element in the success of a Software Engieering program. Faculty members who have a primarily theoretical computer science background might not adequately convey to students the engineering-oriented aspects of software engineering. Faculty members from related branches of engineering might deliver a software engineering program or course without a full appreciation of the computer science fundamentals that underlie so much of what software engineers do. Faculty members who have not experienced the development of large systems might not appreciate the importance of process, quality, and security. Faculty members who have made a research career out of pushing the frontiers of software development might not appreciate that students first need to be taught what they can use in practice. In other words, faculty members who teach Software Engineering need to be Software Engineers themselves. And this is là où le bât blesse (the main problem) in most universities: those teaching cannot do! This is true abroad but also true in most (all?) universities in Mauritius. Mauritius needs universities with teachers who are doers and who know how to make students become doers. And this needs to happen now! Why don’t we participate in the Maths, Informatics or Science Olympiads? 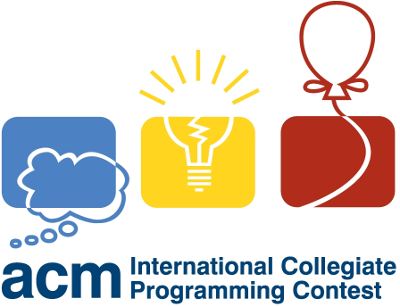 When I was a lecturer at the University of Mauritius in 2006, some colleagues and I selected, coached and accompanied students to the ACM International Collegiate Programming Contest. Our first batch of students, whom I accompanied to IIT Kanpur in India, did honorably and the university participated until 2008 or 2009. Since then, Mauritius has not participated in this world-class programming contest. We participated in the ACM ICPC for 3 or 4 times before quitting (and I am using this word in its strongest sense — Mauritius or, more precisely, the University of Mauritius, quit). 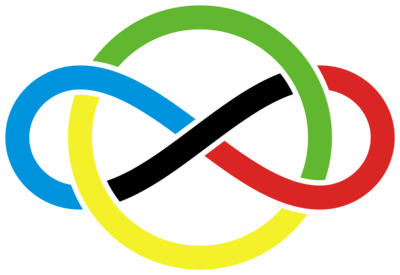 International olympiads are intended for students at secondary schools all over the world. while the Russian Federation started in 1992 and has won 87, 48 and 9 such medals. and Ivory Coast in 2010 who has won 1 silver medal. Some countries which have participated but not won any medal include Sri Lanka, Nigeria, Mozambique and Zimbabwe. and Russia 52, 32 and 12 such medals. and Bangladesh which has won 1 silver medal and 3 bronze medals. and, as I wrote above, Mauritius has also never participated in the International Physics or Chemistry or Biology Olympiads. I have come to realise that people of Mauritius (including, most probably, me) exhibit a strange trait: we believe we are incredibly superior compared to others (our islanders’ mentality probably) while we are, at the same time, afraid to compete with others (probably because we are so far from other countries and because of our colonial past). This has to change. Our best students need to participate in Maths, Informatics, Physics, Chemistry and Biology Olympiads. Or else, how are they going to become world-class? Of course, I am not saying that our students are not good enough. As a matter of fact, this is untrue. Some of our students shine at international level (O Level and A Level). Participating in Olympiads would allow more of our students to shine and, most importantly, discover their talents. In the long run, the average level of all students is likely to rise. And this is precisely what we need in Mauritius to become Smart. On 21 May 2016, students of the African Leadership University in Mauritius organised a TEDx event. They invited me to speak about jobs of the future and how we can prepare for them. I remember, when I was a kid, traveling to my cousins’ place by bus, seeing a lot of men and women cutting cane. I was big enough to understand that, even though this was not a very easy job to do, these people had to do that in order to earn some money. I wonder what most of them do now? I guess most of them are jobless. 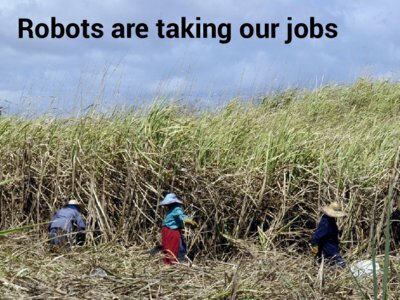 They have been replaced by machines which are more efficient at cutting canes, which cost less, which work on Sundays and do not need any vacation. And this phenomenon is happening all over the world: more and more jobs, which used to be performed by human beings, are being automated. 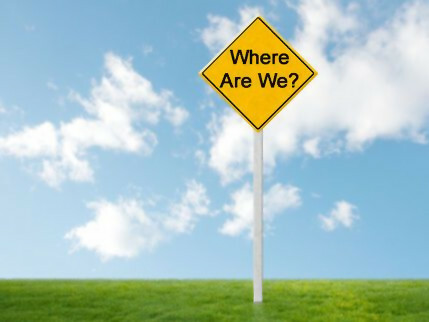 People are being replaced by machines in various industries such as transport (think about Uber and automated vehicles), retail and logistics (look at what Amazon and Alibaba did to physical stores), sales (there are more and more automated cash registers in supermarkets abroad), travel (there are no travel agencies anymore in the USA), etc. Even education is being radically disrupted because of technology (take for example massive e-learning courses). In the near future, a lot of people, who have jobs, will lose these jobs because of technology and automation. This is happening all over the world and Mauritius and Africa will not be spared. Of course, it’s easy to say that only low-level jobs are going to be replaced. We’ll all keep our cosy offices, won’t we? Or will we? This will all depend on how advanced computer programmes can be. Take professional drivers for instance, those working as lorry drivers or taxi drivers. We love to believe that only humans can drive. Yet, we are very bad drivers causing thousands of deaths every year. What If we had automated vehicles? Self-driving cars need not be perfect. They just need to be better than humans. Right now, companies like Google, BMW and Tesla are actively working on autonomous vehicles. According to Business Insider, there will be 10 million of them on the road by 2020, in just four years! 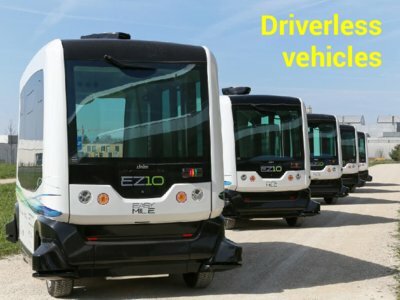 IEEE has estimated that by 2040 75% of all vehicles on the planet will be autonomous. The transport and logistics industry will be completely disrupted with potentially millions of professional drivers in the world losing their jobs. I am sure that some of you are thinking “I am not a professional driver. I won’t ever be replaced by a robot.” Maybe yes. Maybe not. Robot of previous generations were programmed to do one task and one task only. This has drastically changed now. Robots are now capable of learning. An artificial intelligence which can learn at the speed a computer operates can potentially start performing better than humans. An excellent example is AlphaGo, a Google Deepmind supercomputer, which learned to play Go (a game thousands of time more complex than chess) by observing human players initially. Once it understood the rules of the game, AlphaGo started playing millions of matches against itself. Two months ago, AlphaGo played against Lee Sedol, the best Go player in the world and, as you know I guess, AlphaGo easily beat him. On 15 March, the Korea Go Association awarded AlphaGo the highest Go grandmaster rank: an Honorary 9 Dan. It was given in recognition of AlphaGo’s sincere efforts to master Go and, wait for it, for having reached a level close to the territory of divinity. In other words, the Korea Go Association were saying that AlphaGo had become better than human beings. All is not bleak though. Thanks to massive automation, we will probably work less hours and have more free time on our hands. And we will want to be entertained during our free time. In the same way, I can foresee a lot of additional demand for entertainment such as music, videos, video games, mobile and web apps, etc. Those who can create such things will not be jobless. In fact, they will thrive as demand is bound to increase as time passes. 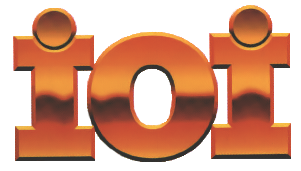 Remember how the cinema and music industries took off during the industrial revolution? Of course, these creative artists will have to be more than just artists. To be able to generate income, they will have to be business people capable of creating valuable entertainment products which other people will want to pay for. 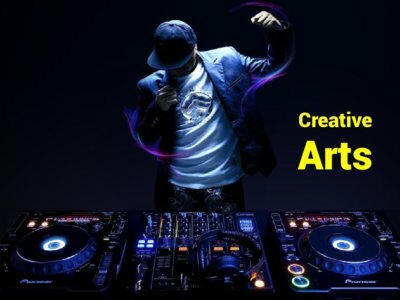 Artists who succeed in creating valuable products will have opportunities to reach worldwide audiences and generate more revenue thanks to the magic of the Internet. If you think about it, this is already happening. Consider the YouTuber for example, a one-person media company using technology to reach potentially millions of people. But you need to realise that we are here talking about a relatively small portion of the population. 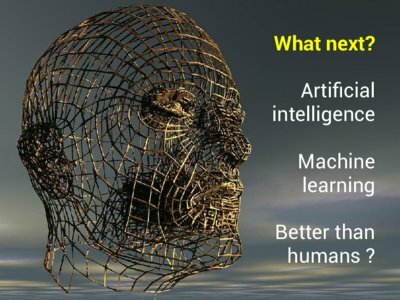 Before you start thinking that I am talking about the distant future, here is a study that was done by LinkedIn at the beginning of this year. After analysing all the recruiting activity that occurred through LinkedIn in 2015, they came up with the 25 top skills needed by employers right now. What I have done is to group those 25 top skills in distinct categories and this is what I found. 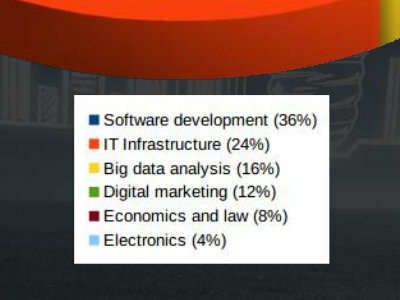 35%, that is 1 out of 3 of the top 25 skills in the world right now is about software development. 30% are related to IT infrastructure which is basically to make sure that technology 24/7. 15% of these top skills are about data analysis, which is basically about making sense of vast amount of data in order to make good business decisions. An additional 15% of the top 25 skills are about digital marketing, which is how to leverage technology to do promote and sell products. Electronics, economics and law are the only non IT skills in this list of the 25 top skills of 2015-2016 and they only represent a tiny percentage of new jobs. 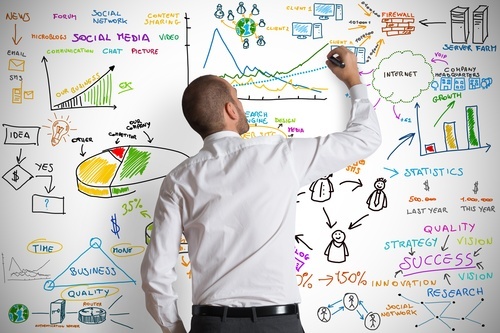 Now, software development, IT infrastructure and data analysis form part of Computer Science. Therefore, it seems that computer scientists will be highly sought in the coming years. A good question then is how one can become a skillful computer scientist? 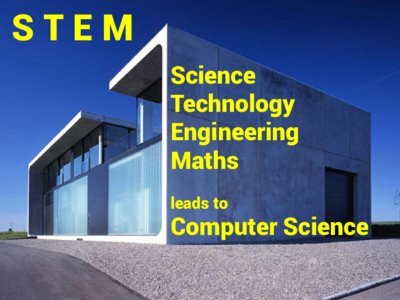 Well, everything starts with a good background in STEM that is Science, Technology, Engineering and Maths. Of course, here, I am not referring to learning the bare portions needed to pass an exam but rather becoming a rational, logical and methodical scientist capable of understanding extremely complex problems and coming up with creative yet feasible solutions. In other words, we need real professionals. We do not need paper degree holders who don’t have a clue. Major countries like the USA, France, Germany, Singapore, China, India, etc. are putting a lot of emphasis on STEM development and this has been happening for years. Now, they are reaping the benefits by having a very skillful workforce with a substantial proportion of technology entrepreneurs. Unfortunately, in most African countries, and this includes Mauritius, only few students choose STEM subjects at secondary level. Only a handful of the most capable ones then pursue higher studies in Computer Science. This is clearly not enough. We need to find ways to encourage young people to chose STEM subjects at secondary level and embark upon Computer Science at university. This needs to be done or else we will lack skillful professionals in a few years. In a certain way, I understand why some students are reluctant to choose STEM and Computer Science. Schools and universities are sometimes too academic and, dare I saw, boring. Teaching methods need to change in order to attract more of our brightest minds. Technology needs to be used to its full potential in class. One way to make classes more interesting do that is to combine STEM with Arts. Instead of creating STEM people, let’s create STEMA people. A STEMA curriculum might include, day, the creation of a video game. 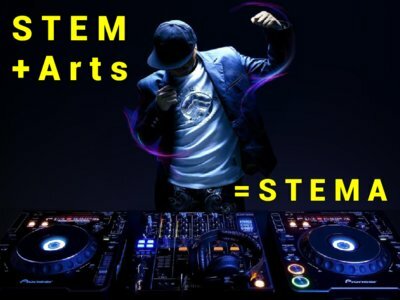 Someone who has been trained to be a STEMA person will be creative enough to design the video game and skillful enough to actually program it and market it. If you think about it, those visionaries who have changed and are changing the world as I speak, people like like Bill Gates (who founded Microsoft), Steve Jobs (who founded Apple), Linus Torvalds (who created Linux, the free software which now powers the world), Mark Zuckerberg (of Facebook fame) or Elon Musk (SpaceX and Tesla) are all STEMA people. They are all Computer Scientists who are extremely imaginative and creative. We need people who who can bring new perspectives, who can disrupt existing industries and change our lives. We need more visionaries. We should stop confining young minds to classroom boundaries. You have realised by now: I am passionate about fostering a new generation of STEMA people, Artistic Computer Scientists. I have tried to do that in the various tertiary institutions where I have worked but I have only partially succeeded at this mostly because of reluctance to change. Eight years ago, I quit being a university lecturer to create my own training company, Knowledge Seven. The initial objective was to provide the best professional face-to-face training in IT in Mauritius. And we did it. But professional face-to-face training is not the solution. This needs to happen earlier and on a much larger scale. This is why, at the end of last year, I took the decision to build an innovative online learning platform called Knowledge Seven. We want to revolutionize the way people learn Computer Science by combining it with Artistry. We want learning to be online. We want people to learn together. We want people to have fun learning. And people need to be able to learn anytime, anywhere. This is not a platform for young people only. It is for anyone, in Mauritius, in Africa and elsewhere, who needs to learn programming, so potentially everyone as computers are so prevalent now, in every field, whether you are in finance or in the media or whatever. The first version of the Knowledge Seven platform will be ready at the end of 2016. 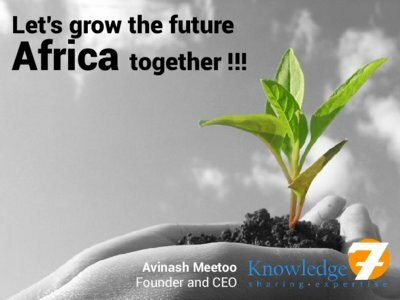 Let’s grow the future of Africa together!!! In the near future, most tasks will be automated and we need to adapt. Our lives will be impacted. Our jobs will be impacted. We, Africans, do not want to be on the sidelines. We want to participate in this digital revolution. We want to build our own future. Let’s create a new generation of Artistic Computer Scientists.